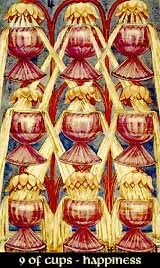 With Yesod - reflection and imagination - inside of the perfect harmony of the Nine, the Nine of Cups has returned to the middle column of the Tree of Life, enlightened by the beauty of Tiphareth that resides above and just one step from Malkuth as its root and origin, the completition of the journey. Nothing serves the waters of Briah better than the seas of Yesod, so the card shows perfect harmony and fulfilment in any emotional matter. On its shadow site, the card shows the risk of selfindulgence and complainsance, the temptation to just enjoy the happiness but forget the reflection that keeps the light upon the waters alive.